Pan de muerto, a delicious sugar-dusted sweet roll, is one of the main reasons everyone loves Day of the Dead. In Mexico City the most common type of pan de muerto is flavored with orange zest or orange blossom, but there are also many other varieties available across the country. Because the Jamaica Market becomes so popular at this time of the year, many vendors come from different parts of the city to set up their stands around this market, literally on the sidewalks. That is the case of Panadería Manolo. 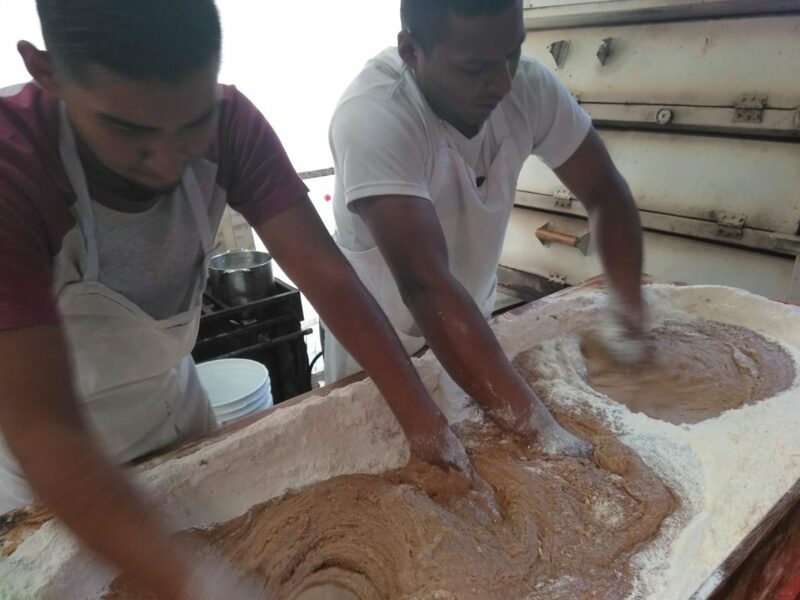 Manolo, the owner, has been running a bakery for 30 years in Iztacalco (about two and a half miles from the Jamaica Market), but every year, with the help of his nephews, he sets up his ovens on the sidewalks of this mercado to offer his own fresh pan de muerto. He explains that this is a great business opportunity that can’t be missed. And what makes his bread particularly special is the family recipe that he uses that has adds an extra touch of cinnamon. Manolo’s nephews preparing dough for the next batch of pan de muerto. The Jamaica Market is also known as the “flower market” of the city, since it has a whole section dedicated to flowers only, that is open 24/7 every day of the year. 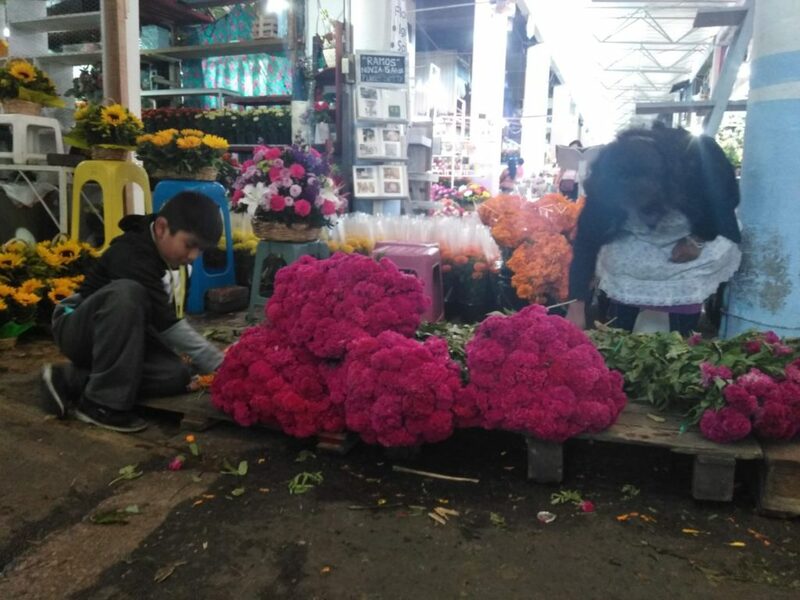 Vendors sell seasonal flowers all year round, but the special ones sold for Day of the Dead are Marigolds, known as Cempasúchil in Spanish, and a deep purply-red flower called Terciopelo, which in Spanish means “Velvet”. At this time of year, both of these flowers can be found in abundance along the flower halls of the market. At this stand, Sebastian helps his grandmother after school while he learns the family business. They have been in that spot since the market opened in 1957. They usually sell flowers that they get from Xochimilco, but during this season, they get their flowers specially delivered from Atlixco, Puebla. The vibrant color of Terciopelo is perfect to decorate Day of the Dead altars. Yes, sugar skulls are very popular, but they are not the only figurine shapes you can find. 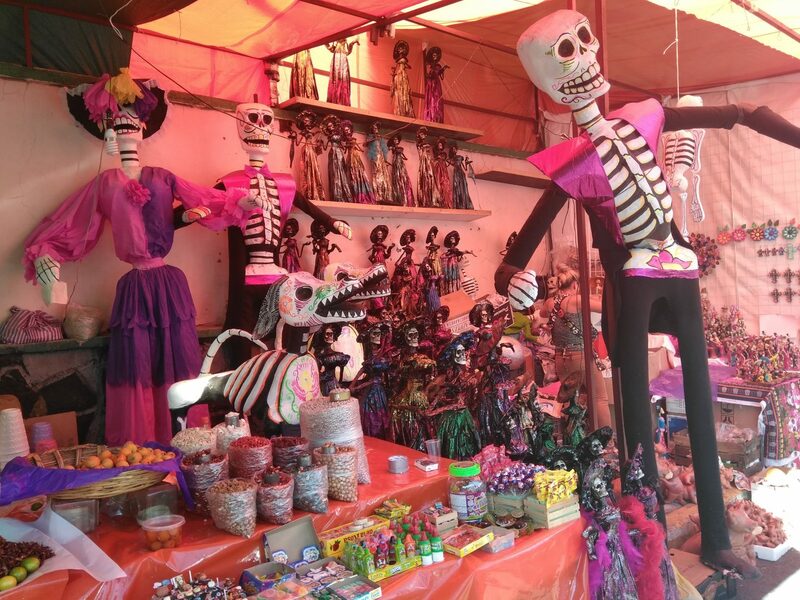 Vendors also sell “Alfeñiques”, which are confections molded from sugarpaste. These are bought in Puebla, where different workshops start making these months in advance to be able to fulfill the demand. These figurines come in many different types of representations. Some represent traditional mexican dishes such as chicken with mole, tamales or pan dulce platters (sweet bread), while others may come in the form of people dressed up as specific occupations such as teachers, dancers and cooks, to name a few. My personal favorite figurine is a coffin that comes with a string attached that you can pull on, which makes a skeleton pop out! 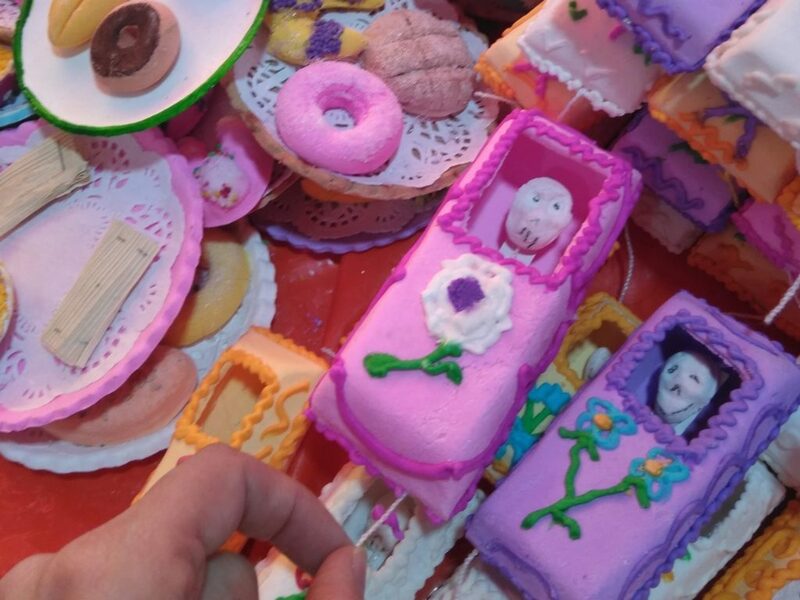 Little sugar coffins: They are colorful and fun to look at, but they taste like pure sugar! They are intended to be used just as decorations. Visiting the Jamaica Market is an incredible experience that will be sure to stimulate all of your senses. 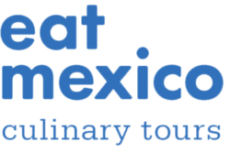 Every year around this time, Eat Mexico offers a special seasonal tour named Day of the Dead at the Mercado Jamaica in honor of this traditional holiday, so don’t miss the chance to join us if you are in Mexico City! Ariane Ruiz is Operations Coordinator with Eat Mexico and one of our culinary guides.